Matthew’s Jesus addresses his (twelve) disciples and tells them they are the salt of the earth (5:13). Luke omits those words; Luke’s Jesus does not so compliment the twelve. Luke finds a vicious way to twist the knife into the Twelve when he moves the scene of the disciples arguing amongst themselves about who will be the greatest into the Last Supper, immediately after Jesus told them that one of them would betray him. 21 But the hand of him who is going to betray me is with mine on the table. 22 The Son of Man will go as it has been decreed. But woe to that man who betrays him!” 23 They began to question among themselves which of them it might be who would do this. Such a relocation of this incident makes a complete mockery of the disciples, intimating that they are ironically disputing over which of them would betray Jesus. We know Matthew’s famous moment when Jesus declared Peter to be the possessor of the keys to the kingdom and the rock upon which the church was to be built (16:18-19). Luke’s Jesus finds no occasion on which to bestow such honourable status upon Peter. Who is the faithful servant? The same is said to be found in the parable of the unjust steward (Luke 16:1-8), the story of Zacchaeus (Luke 19:1-10) and possibly in the parable of the prodigal son where Paul is opposed to his “older brother” (Peter). I find some of the above suggested allusions to Paul in the Gospel of Luke to be strained (e.g. the division between two and three is paired with divisions among fathers and sons, mothers and daughters, and would expect that there should be similar allusions in those roles as well; besides, the account of divisions and warnings directed at both parties hardly seems to favour Paul over Peter). But I do remind myself that I am only reading a summary of a summary. I don’t have access to Hasert’s 1845 original, Die Evangelium, ihr Geist, ihre Verfasser und ihr Verhältnis zu einander. Stay there, eating and drinking whatever they give you, for the worker deserves his wages. Do not move around from house to house. If an unbeliever invites you to a meal and you want to go, eat whatever is put before you without raising questions of conscience. Yes, and I ask you, my true companion, help these women since they have contended at my side in the cause of the gospel, along with Clement and the rest of my co-workers, whose names are in the book of life. This, then, is how you ought to regard us: as servants of Christ and as those entrusted with the mysteries God has revealed. 2 Now it is required that those who have been given a trust must prove faithful. 3 I care very little if I am judged by you or by any human court; indeed, I do not even judge myself. 4 My conscience is clear, but that does not make me innocent. It is the Lord who judges me.5 Therefore judge nothing before the appointed time; wait until the Lord comes. He will bring to light what is hidden in darkness and will expose the motives of the heart. At that time each will receive their praise from God. in my prayers at all times . . . . .
pray continually, . . . . .
To those who by persistence in doing good seek glory, honor and immortality, he will give eternal life. . . . .
Other researchers conclude that the final canonical form of the Gospel of Luke was finalised as late as the mid second century, around the same time as the pastoral epistles in Paul’s name appeared. If Hasert finds as many similarities in Luke to the non-authentic Pauline letters as he does to the authentic Paulines, I would suggest that that is additional data to be used in support of the thesis that the final author or redactor of the Gospel of Luke (and Acts) was not so much a follower of Paul (that is, not the Luke who supposedly accompanied Paul in his life-time) but was as interested in reshaping Paul to make him suitable for “orthodoxy”. If we hold back from seeing as many or as trenchant criticisms of Peter in Luke’s gospel as Hasert does, we may instead notice a more dedicated focus on a narrative that attempts to unite, to equalise, the factions of Paul and Peter. Michael Goulder’s chapter on Paul and Luke requires another post or three, but I will add here two comparative tables that conclude Goulder’s chapter. Posted on 2017-04-13 11:48:54 GMT+0000 by Neil Godfrey. This entry was posted in Biblical Studies, Paul and His Letters and tagged Gospel of Luke. Bookmark the permalink. I don’t have access to Hasert’s 1845 original, Die Evangelium, ihr Geist, ihre Verfasser und ihr Verhältnis zu einander. Archive.org lists that title (https://archive.org/details/MN41964ucmf_10), but the document uploaded is James Bennett’s Lectures on the Acts of the Apostles. (Oddly, the PDF file is some truncated document in Fraktur which I did not have time to identify). Out of curiosity, I searched for & found Bennett’s Lectures listed at Archive.org (https://archive.org/details/MN41964ucmf_9). The document uploaded there, however, is Johannes Schneider’s Die Christusschau des Johannesevangeliums. A search for Schneider came up empty, though perhaps further musical chairs might uncover Hasert’s tome. Die Evangelien, ihr Geist, ihre Verfasser und ihr Verhältniß zu einander : Ein Beitr. zur Lösung d. krit. Fragen über d. Entstehung ders. Autor / Hrsg. : Hasert, Christian A. Does anyone know of an online or open source translating tool that recognizes that Gothic(?) font? PDF-Download is availble with text OCR optional. FYI: As Italic type became more common, popular books had to be printed with mirrored pages of Blackletter (Gothic script), since the older generation (and Germans ???) could not read Italic. note. selected text may be translated via a pop up context menu. Sounds like some corruption has entered into their system. They need to be notified but I don’t see any contact details to enable that. There must be something somewhere. Maybe some clue can be found at https://en.wikipedia.org/wiki/Internet_Archive — but that’s a lot of reading. “[Per] that period in New Testament studies when it was considered quite natural that Luke ”should have been” a sort of critic and one who deconstructed the Gospel of Matthew. This starting point even dominated scholarship in the nineteenth century. The contemporary authors of the time. mostly German. would have been surprised to hear that precisely the “scattering” should be seen as a huge problem with regard to Luke’s dependence on Matthew. These scholars. who have been unmeritedly forgotten, can in part be considered as the predecessors of Austin Farrer, Michael Goulder, Mark Goodacre and …Eric Franklin” (Wittkowsky 2016, p. 4) Ibid. The Q hypothesis was formed to answer the question of where Matthew and Luke got their common material if they did not know of each other’s gospels. But if Luke had read Matthew, the question that Q answers does not arise. We have no evidence from early Christian writings that anything like Q ever existed. When scholars have attempted to reconstruct Q from the common elements of Matthew and Luke, the result does not look like a gospel. Although many scholars originally thought of Q as a sayings gospel, a collection of teachings with no narrative content, all alleged reconstructions of Q from the common parts of Matthew and Luke include narrative about John the Baptist, Jesus’ baptism and temptation in the wilderness, and his healing of a centurion’s servant. However, they don’t include an account of Jesus’ death and resurrection. But from the earliest Christian writings, we see a strong emphasis on precisely the element that a putative Q omits, Jesus’ death and resurrection. Some scholars have attempted to overcome problems with Q reconstructions by claiming we cannot know the actual contents of the Q gospel. However, postulating Luke’s acquaintance with the gospel of Matthew overcomes these same problems and gives the source for the common material. Does it, however, account for the way it’s organized? One of the things I’ve heard about Q is that the originators of the hypothesis noted that this material is in a few blocks in Luke, but scattered in various places in Matthew. If this is the case, it seems a bit odd that Luke would have copied it from Matthew. Collecting everything that’s common to Matthew and Luke and isn’t in Mark seems to me to be a great prescription for collecting some stuff that really doesn’t belong with the rest. Of course, there’s no way of knowing what that stuff is. Wittkowsky discusses in some length just how common in the nineteenth century was the idea that Luke knew and rewrote Matthew and that no-one considered it problematic at all that Luke would scatter the material in Matthew’s Sermon on the Mount. We are in slippery territory when we build cases on what we imagine an author “would” do. We need cogent reasons, evidence. Thanks for this series of posts, Neil. I’ve been on the fence about “Q” for twenty years but lately I’ve been leaning towards the Farrer Hypothesis. I can see Wittkowsky’s (and Goodacre’s) chapter on Google Books, and I think he does a good job of outlining the case that Luke is “representative of the ‘Pauline’ Christianity involved in a theologically significant dialogue, including sharp polemics against the theologians of another Christian school, conveniently called ‘Jewish-Christian.’ The Gospel of Matthew provides, according to this interpretation, the most important negative pretext to the Gospel of Luke…” (pg. 24). Goulder, M. D. (1996). ”Is Q a Juggernaut?”, Journal of Biblical Literature 115: 667–681. Goulder, M. D. (1989). ”Luke: A New Paradigm”. Volume 20 of Journal for the study of the New Testament: Supplement series, ISSN 0143-5108. 2 vols. JSOT Press. ISBN 978-1-85075-101-4. 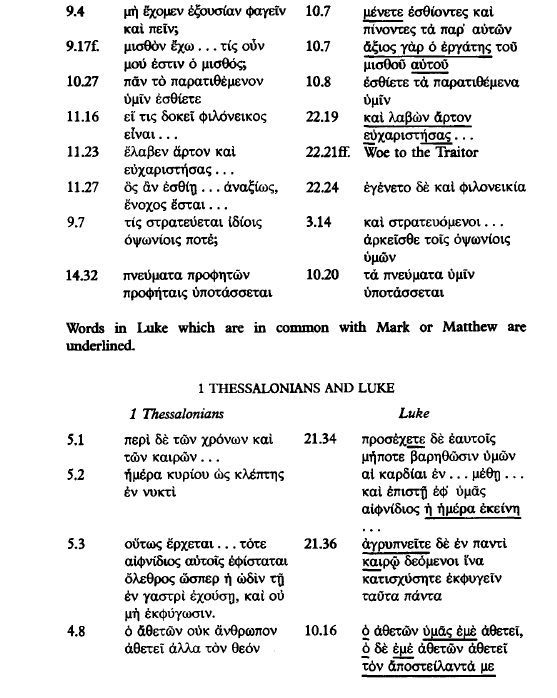 This raises an interesting question: for the material that’s in all three Gospels: Mark, Matthew and Luke, are the differences between Matthew and Luke due to additions of Matthew over Mark, or deletions of Luke from Mark? Or can the case be made that Luke differs from both in those cases where he wants to harmonize with Paul? This seems to feed my suspicions of the importance of Marcion in the mix of the development of the gospel, as I understand that Marcion used an ur-Luke gospel which leaned heavily upon Flavius Josephus along with a grab-bag of Pauline epistles. Marcion’s publishing of these documents would engender the reaction amongst the proto-orthodox to create a canon of official documents, claiming that Marcionite heretics had stolen and perverted the epistles of Paul. To my inexpert senses, Pauline religious expression seems much closer to what I understood Marcionite christianity to have been. Could not what we have received of the ‘original’ Pauline materials be expurgated and edited versions of what was reclaimed from Marcion? And, an ur-Luke? Is the Luke we have a sanitized version of what the Marcionites were using? Or, did a quasi-gnostic Marcionite version exist alongside a proto-orthodox version of the Lukan storyline? I have tended to view Luke as a later attempt to ‘harmonize’ the whole Peter/Paul dichotomy. I can’t say I have any “proof” but I tend to like the idea espoused by a few scholars that the Gospel of Luke as we know it was the last of our canonical gospels and written with a catholicising agenda, attempting to tie together what had till then been competing “traditions” (with the leadership of the church at Rome). Yes, I’d place GLuke as the last of the Synoptics, for sure. As for John…well, it seems like later christology, but I can see the APaul grooving on much of the Johanine material. I date the late Synoptics well in to the second century. GJohn seems to have the oldest extant snippet in Rylands P52, but the tolerance interval leaves a lot of room and includes the middle of the second century. 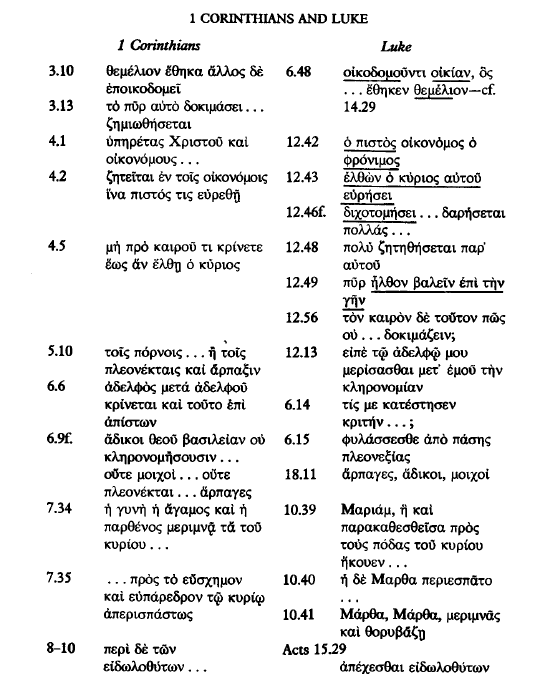 After the threat posed by the Marcionite churches, it seems to me that the proto-orthodox would pull together what traditions they had amongst the congregations, trying to shoehorn in variant congregations by adapting storylines, and coming down to sets of stories, one which would have been the ur-Luke used by Marcion as part of his gospel. Since it had to be reworked to make it fit the proto-orthodox dogma, it would have been the late-date candidate for a universal harmonization effort. The proto-orthodox seem to be more the ‘Judaizers’ the Pauline author warned against, yet they co-opted the teachings. Because they were their teachings, or because they were popular teachings with strong and influential adherents?